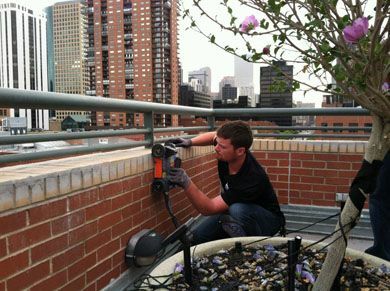 Ground Penetrating Radar Systems were contacted by BC&E of Littleton, Colorado to assist in a project at the Palace Lofts in Denver, Colorado. The customer was fixing a structural problem with the building and needed to verify locations of reinforcement so that they could expose them to confirm the size of bar that was installed. GPRS was able to quickly mobilize and assist in this project using a 1600MHz antenna to locate the rebar. There is no limitation to the size of an area that GPRS is able to scan; therefore radar was ideal for the customer in this application. Ground Penetrating Radar Systems was able to scan a relatively large area quickly and efficiently, and mark the data directly on the surface for the customer. This was important so that the customer could stay on schedule with minimal effects on disrupting the owner of the property. GPRS is the new way to x-ray. In addition to our rebar locating capabilities in Denver, we offer other nondestructive services that include locating post tension cables in Englewood, scanning for underground storage tanks (UST’s) in Commerce City, or locating utilities in Sheridan Wyoming. To schedule a survey contact your local representative Adam Rock at (303) 775-8270 or adam.rock@gprsinc.com.